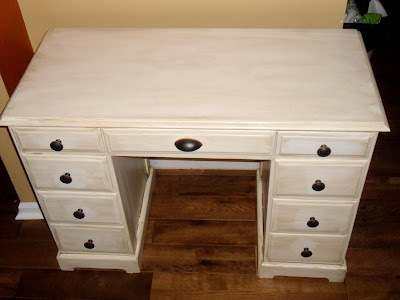 Brandi Nell the Southern Belle: New-ish Desk! Well, we had a wonderful Hubs Fest this past weekend! We celebrated his birthday for an entire week. We went out to eat SEVERAL times (I need to eat nothing but lettuce for the next month) and we even went to the Air Show on Saturday. We saw several different "acts," but of course our favorites were the Blue Angels and the Canadian version, the Snow Birds. We even saw a rocket car race an airplane! Definitely never thought I would see that. Needless to say, we had an amazing weekend. I sanded her first, then painted four coats of white paint. 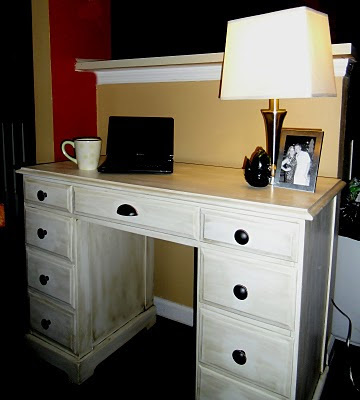 I had originally thought I wanted a solid white desk, but it looked SO BRIGHT WHITE. So, I decided to antique it. I applied stain with a foam brush, then immediately rubbed it off with a rag. It left just the right amount of color behind. After hours of applying, wiping, applying, wiping - I think I finally am happy with her... I have been known to start all over just when I think I am done. What do you think? I need your opinions, friends! It's always a work in progress. Now, of course she won't be staying in this location - it will move down into the office when we finish the room. But WAIT, we had a Home Dept Gift Card, so it was absolutely FREE! Looking forward to hearing from you. As always, if you have a project you want to share - please send them to me at brandi.wigley@gmail.com Hope you guys have a great rest of the week! Talk Soon, Friends! I think it looks great. I've been thinking of doing something similar with a buffet and sofa table, but with a dark top. 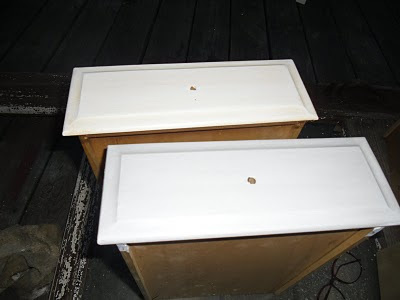 Both have damaged tops, so I think paint is the way to go. Whoa! I didn't know you do this too...I LOVE finding free furniture and fixing it up! 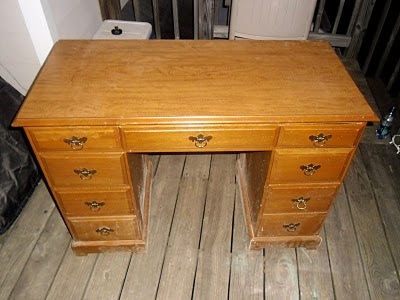 My current project is working on a desk/table that I found to put my sewing machine on. @Shaheen - you and Reine aren't too bad yourselves! I love seeing your projects! @Tru - That sounds beautiful! 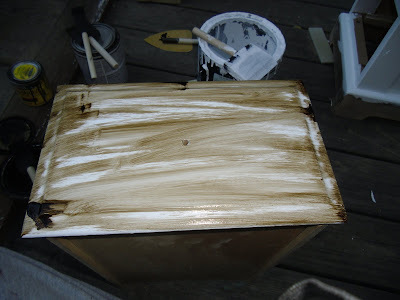 I really was hoping to stain the top of THIS desk a dark color and then do the cream antique at the bottom. Unfortunately, this top was laminate :( I can't wait to see your buffet when you are done! Please let me know when its finished! @Heather - I love rehabbing! In our office we will eventually have TWO desks, one for the computer, the other for Sewing/Crafting/etc! Hope that K had a great b-day week! Katie G (almost M) - Thanks! Let's try and do that together! I have been wanting to do a milk stain/wash too! Katie B - Thanks, honey! Hope to see you soooon! PS: I hope your shade is an the way now! Thanks Linda and Becca! You girls are too sweet! 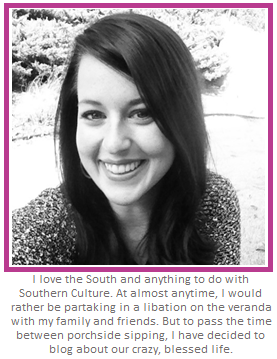 I love my blog friends! Thats such a gorgeous piece you have! Love the finished product!! will you do mine for me?! lol looks great! Funny Story... and third time is a charm?